Alexander Frederick Douglas-Home, Baron Home of the Hirsel, KT, PC (July 2, 1903 - October 9, 1995), 14th Earl of Home from 1951 to 1963, was a British Conservative politician, and served as Prime Minister of the United Kingdom for a year from October 1963 to October 1964. He was the last aristocratic Prime Minister. 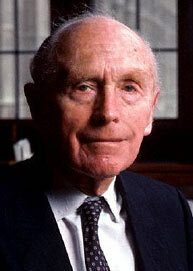 As such, he held a series of records: he was the last member of the House of Lords to be appointed Prime Minister, the first Prime Minister born in the 20th century, the only Prime Minister to resign from the Lords and contest a by-election to enter the House of Commons and, to date, the last Prime Minister to be chosen personally by a British monarch.